Born: 30 September 1879, Bethlehem district, Free State, South Africa. Died: 5 November 1954, Johannesburg, South Africa. Peter von Maltitz Anderson, known as "PM", was the son of Archibald Anderson and his wife, Adrienne J von Maltitz. The family moved to Pietermaritzburg in 1889, where Peter matriculated at the Maritzburg College in 1897. He continued his studies at the South African College, Cape Town, passing the intermediate examination (equivalent to the first year of the Bachelor degree) in 1898, and both the Survey Certificate examination and first Mining examination in 1900. Further studies in mining required him to attend the South African School of Mines in Kimberley. Despite the disruptions caused by the Anglo-Boer War (1899-1902) he managed to complete his courses and was awarded the Diploma in Mining Engineering in 1902 and the Bachelor of Science (BSc) degree in Mining Engineering in 1903. Both qualifications were conferred by the University of the Cape of Good Hope, which was the only recognised university in South Africa at the time. Anderson started his career as assistant surveyor at the Rose Deep Mine in Germiston. He became assistant general manager of New Modderfontein Mine in 1909. After a short period at the Claremont Mine in present Zimbabwe he returned to South Africa in 1911 to become manager of the Princess Estate, a mine in Roodepoort. He became Consulting Engineer to the Union Corporation in 1917, its manager in 1921, and one of its directors in 1927. He also served on the boards of many mining companies, was chairman of South African Pulp and Paper Industries, Ltd, and of the Natal Tanning Extract Company, and a director of African Explosives and Chemical Industries, Ltd. The Chamber of Mines elected him as president five times during the period 1925-1940. His wide technical experience and keen business insight made him one of the leaders of the gold mining industry. Anderson was a member of the Chemical, Metallurgical and Mining Society of South Africa and co-author of a paper on "Ventilation, is it a limiting factor in deep level mining on the Witwatersrand?" which was published in the Journal of the institute in 1942. For some years he served on the council, and as president, of the South African Institution of Mining Engineers. 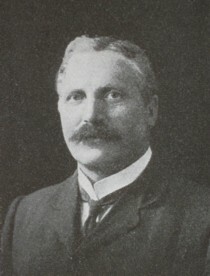 He became a member of the South African Institution of Engineers in 1907, serving as president for 1928/9; was president of the Associated Scientific and Technical Societies of South Africa for 1930 and again for 1931; an honorary member of the South African Institution of Mechanical Engineers; a member of the Geological Society of South Africa; and an honorary member of the (British) Institution of Mining and Metallurgy and the American Institute of Mining and Metallurgical Engineers. His keen interest in education led him to serve on the Witwatersrand Council of Education from 1923 to his death, and on the council of the University of the Witwatersrand from 1925 (and as chairman from 1939) until his death. He was awarded an honorary Doctor of Science degree in Engineering by the University of the Witwatersrand in 1930. Anderson was also interested in farming and owned a cattle farm in northern KwaZulu-Natal where he bred Afrikaner cattle, and a stud farm near Nottingham Road. He served as chairman of the Jockey Club of South Africa from 1938 to 1953. He was married to Annie Laurie Hamilton, with whom he had two sons and a daughter. After her death in 1918 he married Evelyn Elizabeth Gatheral, with whom he had two more sons. The mining township Evander, west of Bethal, was named for his second wife. Annual Proceedings of the Associated Scientific and Technical Societies of South Africa, 1971/2, p. 5, Past Presidents. Chamber of Mines of South Africa. Past presidents. http://www.bullion.org.za/content/?pid=17&pagename=Past presidents as on 17 September 2013. Google scholar. http://scholar.google.co.za/ , publications by PM Anderson. National Automated Archival Information Retrieval System (NAAIRS), at http://www.national.archives.gov.za/naairs.htm Documents relating to Anderson, Peter von Maltitz / Anderson, Peter Maltitz. Obituary: Dr PM Anderson. Journal of the South African Institution of Mechanical Engineers, 1954, Vol. 4(5), p. 207. Ritchie, W. The history of the South African College, 1829-1918. Cape Town: Maskew Miller, 1918. Shorten, J.R. The Johannesburg saga. Johannesburg: John R. Shorten, 1979. University of the Cape of Good Hope. Calendar, 1903/4 to 1917/8.